April is treating us kindly for the most part and it really does feel like Spring has finally sprung here. We took a walk at Bolton abbey on Sunday morning, just a shortish stroll through Strid Woods to breathe in some cool fresh air and stretch our legs a little. Little B was in fine form, a non stop chattering, noisy little mouthpiece on two legs. He could talk the hind legs off a donkey, as my Mum used to say. It's still a bit bare and wintry in the woods, yet I don't mind it too much as it feels right and proper for the time of year. There is bluebell greenery to be found look, but unlike my friends in the south we are still some weeks away from blue floral bounty. I can't wait for the flowers! Come on little buds, shoot upwards! In the late afternoon on Sunday I found a quiet window of opportunity to amuse myself with some gentle creativity. The Little Peeps were all busy with friends and J was wearing his blue and white stripy pinny and cooking up a delicious smelling curry for dinner. I decided to sit and stitch for a short while - I started this cross stitch hoop last summer but it's been tucked away in my project bag waiting patiently for me to return to it. Autumn/Winter generally means allllllll the crochet for me with my annual CAL blanket in progress, so I don't often feel the need to look elsewhere for a creative fix. Cross stitch is such a beautifully slow and meditative hobby, and I honestly adore it. If I wasn't so completely obsessed with my crochet hook then I could easily imagine myself designing with these little crosses. The above design is by Tiny Modernist on Etsy, in case you feel the urge to stitch up some Love letters surrounded by flowers. .....and oh the wild garlic is looking scrumptious. I gathered some young leaves and made wild garlic pesto last year (using this recipe) but this year I am fancying some green, garlicky soup. I came across this recipe today and it is calling loudly to my leaf-gathering soul, so I shall see if I can make it happen. I've had a jug of narcissus on my table for weeks on end now, they've become an essential weekly grocery item that I pop into my basket along with bananas without even thinking too hard about it. They are always right there near the fruit, long stems held together with elastic bands and laid out neatly in cardboard boxes. I simply cannot resist their happy little faces, and the scent too of course. I bought these ones yesterday, and the lady who served me in the supermarket literally scrunched up her nose with disgust as she passed them through the checkout scanner, telling me that she couldn't stand the smell of them. Not me, I LOVE the smell! Today has been bright and sunny, and when I came back home after the school run this morning I found the kitty lounging around on the sofa basking in the sun. She looked so completely content, and I thought : yes indeedy, I know exactly how you are feeling. Isn't it just the loveliest thing to sit a while in a warm patch of streaming sunshine and soak in it's gentle warmth? Yes, it's enough to make you want to roll around and delight in the pure deliciousness of it all! Despite the Spring sunshine, it's been cold these past few days. I was chatting to the Ice Cream Tug Boat Man on the canal yesterday as he opened his boat up for the first time this season - he admitted that he had misjudged the weather and was absolutely frozen. He did look a tad chilled around the extremities I have to say. I'm still plodding around wearing my hand knit socks and boots, and I am very, very happy with that arrangement for the time being. I folded up these freshly washed socks earlier today ready to take them upstairs - well the top pair will go upstairs to join my Sock Pile, the bottom pair will be wrapped up very soon and gifted (finally, finally) to my super-patient father-in-law. I certainly hope his toes adore wriggling inside those cosy, woolly stitches. I bought a new duvet cover and pillowcases yesterday, a spontaneous element of the regular supermarket** shop. I absolutely could not walk past and leave this behind - a king size 100% cotton duvet with a very beautiful Liberty-esk design - reduced in price to a mere £10! TEN!! I came home, washed it, hung it outside to dry and had the utter pleasure of that clean-sheet-smell when I went to bed last night. I woke up this morning thinking that I was in someone else's bed, being that for the past ten years we've always had a plain white duvet cover. The pattern is taking some getting used to, I keep getting a mild shock every time I walk into the bedroom and see my bed looking so overly flowery. ............oh, that's looking a bit yummy isn't it just? A newly FOTH blanket (that's Fresh Off The Hook in case you wondered), there is honestly nothing more satisfying than darning in the very last end on a blanket project that has spanned many weeks. YAY!!! My Dune blanket is finished! I absolutely love love love it, and can't wait to show you more. As I was crocheting the border this morning I was also photographing my progress in preparation for making the tutorial. It's a slow, slow process but I don't mind it too much and good coffee definitely helps. I'm really happy to tell you that I'll be ready to share my Dune blanket with you next week, on Tuesday 16th April. Yarn packs will go on sale in my shop at Wool Warehouse and will include a full colour printed pattern. I'll also be sharing it all for FREEEEeeeEeEee here on my blog, my usual full photo tutorial to teach you the Seashell stitch so that you can crochet up your very own breezy seaside stripes. I hope April is treating you well my friends, and that you are feeling happy and content. It was our half term break last week. We seemed to have it a week later than pretty much the whole of the country and we were all so ready for some idle days of rest and relaxation. It was sooo good, all of it, even the low key days where we forgot what day it was and didn't bother to get dressed until after lunch. With the brood returned to school today and our daily routine restored, I've thoroughly enjoyed the gentle silence here in the house. It made me sit quiet and still this afternoon catching my breath (if you can have an emotional breath to catch) taking some time to reflect and think about how this year is going so far. I took a look through my February photos and reminded myself how very good this past month has been. February can be a tough ol' month and I find that unless I make a conscious effort to seek out the things that make me happy, the days tend to drag by in a slow, dull blur. I really find bluuurrr days very trying so I do my best not to allow them to take hold. It honestly doesn't take an awful lot to make me happy right down to my toes - a short walk by water, a good coffee, a jug of fresh flowers on my table, something colourful and yarny in my hands. All those things would be at the top of my personal feel-good anti-blur list, and instinctively I incorporate them into my days as often as I can. It takes effort to get out for a walk in the winter months, and the Little People can be hard to persuade. But I find that when we do make it happen it's soooooo worth it and without fail I always return home feeling uplifted. These photos were taken mid month, a cold, brisk stroll around the reservoir one Sunday morning. I wore my short floral wellies and paddled in the shallow water, thinking that if I can't be beside the sea then this sandy little reservoir beach is not a bad second best. It was one of those walks where we constantly felt like we were only a few minutes away from a torrential downpour that would ruin everything. The sky was so dark and heavy with the threat of rain, but despite the ominous clouds and eerie light it never actually came, and I was thankful for that simple thing. February was pretty much consumed by the Sweet Pea CAL for me and there wasn't really any time for much else. I spent some days in the studio tidying up and taking stock of things, clearing my table, re-jigging my very full shelves and generally faffing around making everything feel good in there. It's been a while since I had flowers on my studio table so I treated myself to some tulips from the supermarket, and oh they did make me happy! Over the days that I was working in the studio I had the pleasure of watching those petals gently unfurl in the warmth of my cosy room. Such a beautiful visual pleasure, I couldn't stop drinking them in. Flowers reached a peak on my mantel last week, with red hyacinths flowering at one end and bridal crown narcissus reaching for the ceiling at the other end. I absolutely adore narcissus, the scent of them is so sweet and beautiful and so very much a February joy. Out in my front garden and the crocus patch all of a sudden woke up after its winter slumber. We had a welcome amount of sunshine last week and these flowers bloomed their little hearts out. I'm sure they are early (I think of them as March flowers?) but I'm not complaining, they have been a real treat to see every time I come home and climb the stone steps to my front door. The starlings continue to murmur above our house each and every evening, and my goodness, it is a spectacular sight. During the past few weeks the numbers have swelled dramatically and the flock is now absolutely mahoosive. Being that they fly (at great speed) right overhead here at number 24 it's impossibly hard to photograph and hard to describe the true scale of it. I found a beautiful bit of video footage on YouTube - do go and look ((here)) to see the full murmuration effect. The downside is the mess - our street is a bit of a poo zone, our car liberally decorated for the season. Not complaining though, I don't think I'll ever forget this Starling Winter. At the start of our half term holiday last week we were blessed with a short burst of the most incredible weather. Cloudless blue, blue skies and warm hours of sunshine, it was absolute bliss. Last Monday we took Little B on his bike to the park and even though it was February (truly a Winter month here in North Yorkshire) the temperature reached a balmy 18 degrees. EIgHtEen!!!!! It was t-shirt hot, lay on a blanket and soak in the sun hot, close your eyes and make-believe it's Summer hot. .....I saw this online somewhere a while ago and it proper made me laugh! So I kept saying to J last week, this is Fool's Spring we're having you know, and he didn't have a clue what I was on about, but still.......it was glorious, an especially good memory as we appear to be firmly into the Second Winter this week. 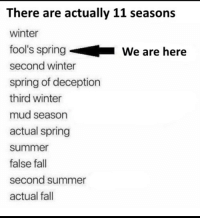 Won't be long until we can enjoy the Spring of Deception. Ha! Coinciding with Fool's Spring, we were fortunate enough to enjoy a couple of short trips away from home at the end of February. The weather was utter perfection and we couldn't believe our luck. J and I took off for a twenty four hour one night away from home just the two of us - we didn't go far, driving just 20 miles into West Yorkshire to visit the quirky little town of Hebden Bridge. We booked into a cosy little pub B&B high on the hill above the town, and spent our time walking and pootling in the sunshine. During half term week, we decided very last minute to take a short family holiday over to St Anne's on the Lancashire coast. We've stayed here a few times before and were able to book the same house which was delightfully relaxing and familiar. I won't bore you with more weather details (just look at that sky!!! ), but well, it was bloomin' wonderful. We celebrated J's Big Birthday (he reached the big 5-0 like me) and it was just the best little holiday. The tide very rarely comes right in at St. Annes but occasional storms bring the waves right up the beach to the base of the sand dunes, leaving behind a strandline rich with seaside treasure. I just can't resist the urge to collect and gather when I'm by the sea, it's such a deeply ingrained habit that has been with me since childhood. You can see how my creative coastal playtime took a hold.........got lots more to show you very soon!!!! I seriously love the above photo in all it's faded, wintry mellowness. It was one of those misty, murky mornings that we seem to have experienced quite often this winter, when the days have felt very slow to get going. This type of weather makes me want to cosy up inside and drink endless mugs of strong, frothy coffee, and yet there is also something refreshing about being out and about and breathing in that damp, cold air. Its snowdrop season, and our tiny clump of front garden flowers have pushed their way back through the earth for another year. Earlier today, we drove past the huge patch of snowdrops which always grow wild at the top entrance to the woods (see this post) and I made a mental note to walk up there very soon to see them. Whizzing past in the car just isn't good enough, these sweet flowers deserve to be given a thorough dose of heart-felt appreciation. Top of my to-do list :: Go Appreciate Snowdrop Patch. My weekend was slow and quiet, just the way I like it at this time of year. I spent much of Saturday sat at the dining table drinking coffee, knitting bits of sock and drooling over the pages in the latest Sarah Raven catalogue, specifically pages 4 - 21 which showcase the Exclusive Dahlia Collections. Oh my heart. Dahlias are just the bees knees, and I've been swooning over them for a great many years (just re-reading this post where I quite literally "fell" for the dahlias at Cragside - ha! True story, I do get giddy to the point of not being able to remain upright at times. It was so nice to get back to a bit of knitting after such a lot of Sweet Pea-ing of late, and I did enjoy being quietly industrious with all those neat little knitty rounds. I turned heels and knitted gussets and made great progress on these belated Christmas gift socks for my patient father-in-law. For anyone interested, I knit my socks using the continental knitting method which allows me to tension the yarn in my left hand in exactly the same identical way as I do when I'm crocheting. It's absolutely marvelous and allows my hands to almost think they are crocheting when in fact they are being very clever and knitting instead. You can read more about my methods in this post. Something amazing has started to happen here in Atticland this winter, and it is SOoooooOoo amazing that I'm still feeling a bit in awe of it all. We've been living here for eleven years and have never witnessed it before - a daily starling murmuration. It's an absolutely incredible natural display (you can read more about it here, which includes a short video clip) and the fact that it's started happening literally right over our house is just mind blowing. It starts just as dusk is beginning (around 4.45pm at this time of year) and lasts around half an hour. The birds gather gradually and the flock gets bigger and bigger as the minutes pass until there are literally thousands and thousands of birds fluttering overhead. They fly together in the most mesmersing of ways, in twists and turns and undulating waves, it's impossible to take your eyes away and inspires you to take around 267 gazillion photos of the sky. All my photos were pretty rubbish (I was doing the giddy thing again and leaping excitedly across the furniture), but I enjoyed myself trying. I really, really, really hope this is going to be an annual winter thing around here. We walked at Bolton Abbey on Sunday for the first time in a while, and it was just lovely. A bit cold, grey and dull but still so good to get out and about amongst the trees. We left the Teen in bed, waved Little Lady off to work (she has just started her very first weekend job waitressing in a cafe), and set off to walk with Little B in tow. Despite the leaflessness of the winter season, I was overjoyed to see so many fresh new bluebell shoots already peeking through the undergrowth. And moss too of course, I'm always excited to see how well it thrives at this time of year. Mossy trees are just super aren't they? Kind of fairytale-ish and magical. Sunday was also a day of doing allllllll the laundry which I didn't manage to do on Saturday because I was too busy knitting my gussets and slavering over photos of dahlias. I worked through four whole loads, washing and drying, then up to the bedroom to fold and stack on my bed. I am so in love with my bed, and can't tell you how much I look forward to climbing into it each night. I mean, I really do enjoy my days, but bedtime is always such a highlight! With the chilly weather I've got a double layer of blanket warmth on my bed at the moment, and as I was sorting through all the laundry yesterday I found myself really appreciating the spread of colour and pattern. The bottom layer is my beloved BB which is almost ten years old now - you can see more photos of it here). It's a big 180cm square beast made from Rowan Pure Wool DK and is extremely heavy and warm. On top of that I've got my Sunny Log Cabin blanket, and this stays on my bed all year round as it's quite light and is OK for the Summer months. Gosh, I do so love this blanket, it's one of my all time favourite makes. It uses 18 balls of Stylecraft Special DK which is called the Sunny yarn pack. I made this blanket as a CAL project at the end of 2015 - all the CAL installments are still on my blog if you fancy creating your own dreamy blanket. Back downstairs and I've got a new candle on the go this week. It's another one from Next, I do so enjoy their scented candles as they are very economical and burn for aaaaages (50 hours in this jar, seriously!). Oh, and they smell gorgeous too - this one is Bergamot and Green Tea which I think I had last winter too. It's fresh and sweet without being overpowering and makes the living room smell really good. We're still lighting our fire every day and appreciate it very much. The kitty is often sprawled out on my floor cushions right next to the hearth (one of my favourite places to sit and crochet) and I never have the heart to turf her off. So I feel as if I've not had the real benefit of quality fireside time just lately, although I do so love to see it (and hear it) as much as I like the warmth and comfort it provides. This morning, and another outing to Bolton Abbey, just J and me this time. We hadn't planned on going seeing as we were only there yesterday, but after school drop off and a quick supermarket shop I just felt like I wanted to be back there again. The sunshine was calling me to go tramp those winding pathways....almost impossible to resist! We walk further and faster when it's just us two, crossing bridges and taking a big loop around on both sides of the river. Another tree which caught my eye with its fabulous bark - it looked like it had been smocked! It reminded me that I went through an obsessive smocking phase when I was in my mid teens, painstakingly embroidering a whole collection of hand stitched and smocked dresses for a ragdoll that I made at school. I would so love to see those handmade things again, I was such a shy, quiet, daydreamy, stitch-obsessed type of teenager, always away in my own little private, creative world. Don't suppose I've altered all that much, come to think of it. As well as mossy roots and smocked bark I spied catkins galore, gosh they are putting on a spectacular show this year. I find them so charming - little dangly reminders that Spring isn't too far away. I dearly wanted to pick some to bring home, but didn't feel that it would be acceptable to steal from the trees so I left them hanging in the morning sunshine. We stopped off at the farm shop on our way home to pick up a joint of meat (I'm making smoky barbecued pulled pork in the slow cooker tomorrow), and rather predictably I found myself drawn to the floral offerings before I could make it anywhere near the meat counter. I decided to treat myself to a small pot of Narcissus "Bridal Crown"which I know from past experience will smell divine when they flower. Having pots of bulbs growing in the house is such a pleasure, I can highly recommend it if you want to bring a dose of Spring cheer into the winter time. J and I took a short walk in the woods on Monday afternoon, you know when you sometimes crave the simplicity of nature, fresh air and a gentle tramp along familiar pathways? I honestly felt the pull so strongly on Monday, a deep need to be out of the house and among the winter trees. There was low slanting sunshine and an earthy smell which felt very beautiful to me after a tense morning of doing accounts and ticking off a list of mundane jobs. We walked the high pathway through the top of the woods which passes by the Stalking Horse, oh I do so love this willow sculpture. I had a sudden urge to drape my Sweet Pea blanket over his back just for the fun of seeing all those glorious colours against the brown of the winter woodland. Next time the sun shines brightly and I've got an hour to spare I think I shall do just that. I am smitten with the #crochetinthewild hashtag on Instagram (if you take a look HERE you can see plenty of Sweet Pea blankies braving the elements, love love love it!) - I want to be a part of it. And I shall.....the willow horse will help me! Today, not a scrap of winter sunshine to be seen in Atticland, just dull white and varying shades of grey. It snowed in the night, a thin, crisp layer of icy flakes which lay frozen on the ground in the sub zero temperatures. We crunched to school along the canal, and Little B managed to scrape together the smallest, iciest little snowballs I think I've ever seen. I'm feeling miffed because my camera has developed a dark smudge which is inside the lense somehow and no matter how much I wish it, I don't expect it'll magically go away. So that blob in the snowy sky isn't anything flying towards me, it's there inside my camera, and urrrghhhh. I really wish it wasn't. It's truly the depths of winter here, and in the quiet of today I've been glad of it. I've wanted nothing more than to hide away and be still and silent, as I've felt rather drained of energy and lacking my usual bounce. I was chatting about blogging to Christine today, and it made me realise that aside from my weekly CAL updates, the rest of my posts all seem to be ridiculously similar and filled with very little of note. Snow. Moss. Woodland. Coffee. Flowers. It's all so very unremarkable (and possibly rather boring), and yet I really do love to record these simple moments in time and share them with you. I've no idea why it makes me feel so good to do this, but I do thank you from the bottom of my heart for visiting and reading and commenting. You make me feel like I'm doing OK, even in the very quiet of winter when life is slow and predictable and not a lot is happening. Oh, and how do you like the moss : winter edition, isn't it just a bit wonderful? That stuff is just so admirably hardy. I took the time to make myself some top notch lunch today, and bloomin' heck it was divine. DIViNe I tell you. Lightly toasted sourdough bread, a little mashed avocado (heavily seasoned with black pepper and sea salt and the weeniest drizzle of olive oil), then two creamy poached eggs plopped on top. The eggs are supermarket ones, but the good posh variety where the chickens are named (they are Clarence Court Burford Browns, in case you wondered) and my goodness they are excellent. Anyone wanting the Poached Egg Know-how can go to my blog post (from almost SEVEN years ago!!!) - it's a skill that is well worth mastering and you will never look back I promise you. Eggs for days and days. I spent this afternoon working on my CAL post ready for Friday. I carried my laptop away from my draughty desk under the window and set myself up in the Big Chair. Wriggled the chair forward and around so that I was facing the fire which we lit just after lunch. I had my Summer Ripple blanket wrapped around and it was so cosy! I spend a lot of time putting my weekly CAL posts together, creating a gallery of images to celebrate our crochet community as well as sharing my own photos of the two blankets I'm making. It's all-consuming at times, but I do love it. Over on Facebook I'm already getting asked about what comes next after the Sweet Pea....well there is another blanket in the pipeline (rather far back in the pipe, but it's there), and that will be coming towards the end of April. I'll tell you more about it once the Sweet Pea is complete. I've also got a list of other things that need doing (my felted basket is top of that list) so my Creative Mind is pretty full right now. That's often the way of it I find - during the times when I feel like hibernating and being quiet and slow, my Creative Mind decides to ramp it up and all manner of things start to demand my attention. It promises to be an interesting few months ahead as I attempt to juggle it all. I hope that whatever you're juggling right now is making you happy and not overwhelmed (it's a fine balancing act), do share what is on your creative wish list for the next few months, I'd love to hear what you're planning. It's been snowing here today in Atticland - not a huge amount, but enough to beautifully dust the hills and rooftops and see us setting out to school this morning fully wrapped up against the flurry of freezing flakes. Little B very excitedly (and rather optimistically) asked me if I could manage to find his ski goggles (old inherited ones, we aren't a ski-type of family) as he felt sure that a flurry of snow in the morning would equal some sledging action after school. Sweet boy, I didn't have the heart to tell him that the brief snow shower we walked to school in wouldn't be nearly enough to merit the wearing of extreme winter gear. I walked up to the park on my way back from the studio mid morning, just to see if there was any remote chance of needing goggles, and it was oh-so-pretty out there. ....and there was a soft glow over the landscape which made me sigh with pleasure. I can certainly appreciate the beauty of the winter landscape, even if I would much prefer to see dancing green leaves on those bare branches. There is a clean clarity which I do enjoy, the pared back bareness makes me feel like I can breathe more deeply somehow. The trees were dripping wet and the sight of the light-filled water droplets stopped me in my tracks. Much like reflections on still water, I find myself captivated by the suspended beauty of water droplets, such a still, precious moment in time. ............isn't that something? My camera is a small point-and-shoot type with all settings on auto (it's a Sony - this one), but I do have a very steady hand and a good eye for pointing it at visually appealing things. I showed the photo to Little B, and explained about the image being upside-down as the water acts like a lens...I felt quite science-ish and intelligent for a brief moment in time (!) and he was suitably wowed. Nature is bloomin' mind blowing at times. Coming home from school at 3.30 and not a scrap of snow remains here in the town, so no real need for protective eye wear after all. The hill was still looking mighty fine and winterish though, and it was most definitely hat weather. I noticed today how light it still was at 4.30pm and my heart literally felt like it was expanding with pleasure at that thought. We've still got a whole lot of winter to come through yet as Spring doesn't make an appearance in Atticland until well into April, but we are on our way. A whole month since the Solstice, we are On. Our. Way...............!!!! Very happy about that!!! We ventured out into the cold, cold wintry countryside yesterday, J and I, for a brisk walk around Grimwith reservoir. As you can see, the water levels are frightening low (photos from April last year show how full it was then) and I hope very much that we're not headed for any sort of water shortage situation. It was blinkin' freezing out there in the Dales yesterday, and even though I was bundled up in extra layers, with my woolly hat pulled down low (yes I'm still wearing that very same hat), the cold wind seemed to reach my bones. I am always fascinated by moss at all times of year (it's an enduring crush that I have), but in Winter it really makes me love it to distraction. It's so hardy and vibrant, like a bright beacon of natural positivity amongst all the muted dullness out there, and I adore it. Now get this ---- I just did a quick online moss search and found a mossy blog!! It's called "Moss Musings" (seriously!!) and the tag line reads "for all the buzz about your favorite fuzz..." Oh. My. This is utterly brilliant. I'm laughing into my tea at this point, that tag line is just...well, beyond words really. Life is fantastic when you discover such small and quirky things that make you laugh out loud. I like lichen too....any lichen fans out there? Its such a subtle and sublime colour, like the true essence of winter (along the lines of eucalyptus, that soft grey-green is just lovely). I do so enjoy the small details of a walk as much as the bigger long distance views. Being out in the winter countryside is such a tonic, not just physically for the fresh air and exercise, but mentally too. It's like opening a window when the room becomes too stuffy, I find that having a stuffy brain can feel very draining at times, and fresh air and open views make a huge difference to my thought processes. It's liberating, and I really appreciate being able to do this on a Monday morning. I like to chat to J about my crochet and blogging plans as we walk, I know he doesn't really "get it" but I enjoy offloading onto him regardless. I'm pretty sure he doesn't mind me laying it all out as we walk, it certainly helps me to feel clearer in my mind and more energised for the days that follow. I made massive in-roads into my ridiculous to-do list this morning, and I'm sure it was because of my outdoor walking therapy session yesterday. I can highly recommend it. And to end the walk........a rainbow, the best winter colour of all. Back here in the Attic, and Winter colour is mostly yarn related, of course it is. I gathered up a pile of clean socks this morning to take them upstairs - they'd been drying on the radiator downstairs and honestly I just swooned a little at the sight of all those delicious stripes. For those who don't know that I knit socks (I do, I do! ), you can follow my "Socks" category in the sidebar for all previous sock posts with yarn and pattern details etc. I didn't make many pairs last year (I'm not sure why .... oh hang on .... yeah .... cross stitch happened! ), but plan to have a few more pairs on and off the needles this year. I fear I am obsessing about my eucalyptus in a way that is a bit weird, but I can't seem to help it. Gawd, I love it so much. It's become my daily ritual....I sit and sip that delicious first coffee of the day, and rub a little euc leaf between my fingers to inhale at the same time. I think smelly pleasures are highly underrated. My sofa is a bit of a colourful mess right now, but I am really loving the riot of colour and pattern. In fact, the whole house is a mess, but I am going against the current January trend of decluttering and clearing and simplifying and choosing to embrace the cluttered, lived in look, just for the time being. Clearing may happen in the Spring, I'm in no rush. I was working on my sweet pea blanket for lots of hours over the weekend, and found myself wishing (for the umpteenth time) that the yarn would magically smell like sweet peas. Actually, I read on Facebook somewhere about a lady who puts a scented soap in her organza yarn bag along with her yarn and current project, and I thought that would be well worth a try. So I'm off to search for sweet pea soaps now, I think this could be a Good Thing. Do you know something, I do really rather like January for it's sheer newness and optimistic feel. As is the norm, I have been rather late sorting out my new calendars (I have four throughout the house) and still have my main family writing-on calendar to update with birthdays, school holidays etc. But the sight of that clear January calendar page is making me feel all cleansed and delighted and positive about the year ahead, possibly because the page is currently blank so it looks as if it's all free time and nothing pressing to remember at all, no appointments, no Birthdays, nothing doing AT ALL. That isn't the case of course, there has already been one Birthday (Little B turned nine on the 5th), there is another family birthday next week I think, and I've had my first Yarndale meeting of the year this morning. It was only by sheer chance that I actually remembered the meeting at all, I really must get my act together. I ordered a new Erin Condren Life Planner last week, again with the lateness I know. I cannot wait for it to arrive as I do feel like I need it - I've a head full of lists and plans and dates, and I'm so going to enjoy those blank pages and sticker therapy. Bring it on...I'll show you when it comes as I've gone for the hardbound version this year for the first time, it was cheaper than the ring bound and had 20% off at the time I snagged it, so that swayed it for me. So I thought I'd bob in to the Attic and chat about this and that, no New Year's resolutions or magic Word of The Year, just a deep desire to live every day with a joyful heart and positive outlook. I feel very good for January actually (I often don't feel at all well at this time of year), I'm not exactly bursting with energy but something calmer and more sedate, a kind of low hum of energy perhaps? It feels good I have to say. The above photos were taken on New Year's day, a short family walk through the woods in the pale morning sunshine. It was busy amongst the trees, and despite the above pathway being clear of other folk at the time I snapped the photo, we met and greeted so many other families out walking. It was a lovely way to mark the first day of the year. During the past week in the lull after New Year, we all kind of slumped here in the Attic. Well, that's not true exactly as it was mainly the rest of the family taking it easy while I worked my socks off creating the Sweet Pea Cal post and full pattern tutorial. And I've spent an incredible number of hours on social media too, which is all part of the CAL experience for me. But look, see, there were still moments where I wore pyjamas and woolly socks and settled down to crochet a few quiet rows, so it all balances out in the end. I have really, really, really, really enjoyed seeing how the Sweet Pea blanket has taken off with you all, it's giving me the most incredible feeling of deep down happiness. It's very hard to put into words that feeling, it's so emotional for me, and feels quite raw at times. I often feel very moved and tearful when I read about your experiences of the colours and the joy of those rows growing, it never gets old. I love sharing my blankets with a true passion. There's a glimpse of Big Blanket on my bed too, still making me very happy and keeping us cosy in the cold weather. Can't believe this blanket is almost ten years old now. I lit my Sweet Pea candle over the weekend, it's lovely! Truthfully it doesn't smell an awful lot like Sweet Peas, but the scent is lightly floral and unmistakably summery so I'm good with that. It tickles me that the text on the side of the tin says "The One I Truly Love" as it makes me think of my blanket every time, awwww, I'm a bit in love with my Sweet Pea blanket!!! I packed away Christmas at the weekend, gosh what a mammoth event that turned out to be. I had to pull out the sofa to retrieve all the bells and baubles that the kitty had hidden under there, and that resulted in a huge bout of manic guilt-cleaning. Oh, the fluff and miscellaneous detritus to be found behind the sofa was quite shocking, but it's all ship-shape now and I'm trying to erase the memory of how bad it had gotten. Removing Christmas from the mantels gave me a reason to dust, polish and faff, and set up a little bit of a Winter theme. Do you remember my simple crochet garland from last year? It was so lovely to unpack it from it's "winter decoration" bag and enjoy those soft seasonal colours again. I've got some hyacinth bulbs just starting out - these ones were labelled as being Red (not pink) so I'm really looking forward to seeing what they turn out like when they bloom. I'm also LOVING my new painting by one of my favourite artists Annabel Burton. I commissioned this canvas from Annabel after seeing something similar on her website, isn't it delightful? I love the wintry trees, but also the feeling of soft light and seasonal change which makes me look forward to the months to come. She is such a lovely lady and I adore her style and colour sense - you can keep up to date with all her latest works on Facebook, tell her I sent you! Yesterday morning the sky was beautiful over the rooftops and I couldn't wait to get out there and breathe in the cold wintry air. .....an afternoon at Coopers cafe with my fabulous yarny ladies, jaunting up and down my Trellis Stripe rows. And look - what do you make of my Drink That Isn't Coffee???? That's a rare sight indeed, to see me at Coopers without a mug of frothy coffee in hand!! I decided on a whim to try out the Very Berry smoothie and my goodness, it was utterly delicious and extremely fruity and berry-y. I could positively feel it doing my insides good. Do you remember me telling you that I'd ordered myself a Eucalyptus tree? Well it arrived in the post last week, all snug inside a cardboard box, and oh oh oh, I do love it so!!!!!! I think it's amazing that you can order a tree through the post - I ordered from Amazon and it just pleased me so much to unpack it and examine it and think to myself "it's my very own tree!" Come to think of it, I don't think I've ever bought a tree before, not ever in my life. Ha! No wonder it was so bloomin' exciting! For those who have asked, I'm intending to keep my eucalyptus tree in the back yard, growing it on into a large pot and keeping it pruned/trimmed to keep it under control. I've already snipped a few stems to have on my table, it's the most wonderful thing to be able to inhale that distinctive eucalyptus fragrance whenever the mood takes me. Ok, I'll stop going on about it now. In other news, I purchased my first bunch of annual daffodils yesterday when I spotted them for £1 in the supermarket. I always wait until January to do this, even though I saw buckets of daffs as early as November. It's become one of my New Year traditions, and makes me very very happy. Can you imagine....fresh eucalyptus AND daffodils in the house????? I might have been a little bit giddy. .....and today they bloomed in glorious fashion. So joyful, and such a lovely bolt of bright colour when you come into the room. A rare photo of the kitty - she detests having the camera pointing at her, but I like to do it anyway. Actually, this is a really bad photo, the sofa is sloping and my cushions are slumped and my blankets are untidy.....but it's home in all it's perfect imperfectness. The cushion on the right (the fabric one) is one I made years ago for Connievan. It has huge sentimental value because it has the original caravan cushion inside it, and when you open the zip and sniff the cushion it still smells of the caravan. Sounds a bit weird, but that smell is so nostalgic and sweet, gosh I do so treasure the precious memories we made with Connievan. And so that's where I'm at as we gently step into 2019, rejoicing in this quiet life that is uniquely mine. I hope the year is treating you kindly so far, and that you feel optimistic and and positive about where you're heading. I'm wishing you lots of brightness in your days! Helloooooooo!!! I'm giving you a big and long overdue enthusiastic wave from the Attic window as I sit here on the very last day of the year and think about the weeks that have passed. I've been trying to write this post for the past few days and am happy to have finally managed it now that we're on the flip side of Christmas and teetering on the brink of the New Year. D you know, I wrote the title of this post and then wondered if chitter-chatter was actually a proper word so went to look it up. Turns out it is indeed and means "informal and inconsequential conversation", which about sums up the overall gist of this post (well most of my blog posts actually). So I hope you're up for a some inconsequential chitter-chatter and a few photos to go with it? Onwards!! Little B remarked to me this morning that this holiday has already felt super-long and I had to agree with him. It seems like aaaaages since we managed to exit the house at 8.30am and walk to school along the canal. This past week has been lazy in the extreme - there have been late nights and late mornings, entire days spent in pyjamas, erratic meals and way too much chocolate and screen time. It's been relaxed and restful, a much needed respite from the routine and clock watching of our school and work days. I for one have relished it all, have loved the slightly chaotic nature of having us all home together enjoying the long slow hours of nothing in particular. I made a journey down to Dorset a few weeks before Christmas, travelling the 300 miles by train and bus. This is the second time this year that I've been to Dorset on my own, and although I'd much prefer to have J and the Little Peeps with me, I've come to appreciate the pleasure of travelling alone. I do enjoy a solo train journey where I can divide my time between reading, listening to music (Christmas tunes on this trip), browsing Instagram/blogs and crocheting, with some idle scenery gazing and day dreaming thrown in for good measure. I was pleased to find my Dad in good spirits and although we don't always see eye to eye on things, we generally manage to rub along OK for a few days at a time. Obviously I was mainly visiting to spend time with Dad and Lady B, but there is also a really deep need in me to be back on my home turf from time to time, for personal, nostalgic, feel-good reasons. Oh, I miss it there, I really do. We walked to West Bay on a bright and breezy day in mid December and it was everything that I needed it to be. It was fresh and brisk, with blue skies and sunshine, noisy, pounding waves and salty sea spray. We walked around the harbour and out along the pier before heading to the cosy warmth of a local pub for a quick drink to fortify us for the two mile return walk. I was away for three nights and J did a fabulous job of keeping the home front ticking over in my absence. In fact, I'm sure the Little People didn't really miss me at all, although I did receive the biggest hug from Little B when I got in through the door, so I think perhaps he missed me a smidge even though he insisted that he didn't. This year, as is the norm for me, I treated myself to a few little from-me-to-me Christmas gifts. J and I don't exchange gifts with each other and never have done in the twenty five years we've been together, so I feel it's absolutely ok to gift to myself. I bought the above book which I've been curious about for a a few years, and I would love to tell you I carved out time to read it but I don't want to lie to you. I've flipped through the pages (some glorious photos and illustrations) and dipped in and out of the chapters, but I'm saving the serious reading and absorbing of it for January. Two other things I treated myself to - a Sweet Pea scented candle ready to light on 4th January when the Sweet Pea Crochet-Along begins, and a tree. HA!! Yes, I bought myself a tree. It's only a small sapling (1-2 foot high) and it hasn't been delivered yet but I'm beyond excited about the idea of it, mainly so that I can have access to it's leaves to squeeze and sniff to my hearts content......yes, it's a eucalyptus tree. I plan to grow it in a large pot in my back yard as I know they can grow into beastly big things, and I am just giddy about it. I'll show you when it comes! I've been yarning along with myself during the past month of course, but haven't got anything much that I can show you. I've got a pair of socks on my needles which are a belated Christmas gift for my fabulous father-in-law. I'm not going to show them here just yet as I have a feeling he occasionally peeks in through my Attic window. They are stripy and fairly manly (blues and greys) and I'm enjoying the little stitches very much. As you can see above, I also tried my hand at making a critter a few weeks ago which was unexpectedly challenging (not the crochet so much as the facial features). I've got lots more to show you about that but can't just yet as this was a pattern test for a friend, so I need to wait for her nod. But if you know her critters already you will know that this is going to be one cute little thing. Oh it's so difficult to make animals look cute though, I had no idea! In other creative news, I've been totally obsessed with my Sweet Pea blankets. In previous years I've crocheted the blanket more or less at the same time as I run the crochet along (just a week or two ahead so I can get the photos ready in time). But this year, as soon as I made the decision to offer two versions of the blanket I really had to get cracking as a LOT of hooky hours are needed to create two whole blankets. So I made the Posy version first and I'm now working on the Colourwash version, and I'm really, really, really looking forward to Friday and sharing the pattern and first colour installments with you. I'd like to take this opportunity to thank everyone who has bought a Sweet Pea yarn pack from my shop at Wool Warehouse, I'm just thrilled to bits that our online crochet community is such a happy, positive and thriving place. In the week before Christmas I finally started to think about gifts for family and friends. I decided for various reasons not to write Christmas cards this year, and instead I gifted potted bulbs to friends who I knew I was going to see. I bought some single hyacinth and amaryllis bulbs from the farm shop, wrapped them carefully in gold tissue paper and popped them into paper gift bags. I know how much pleasure I get from watching hyacinths grow and bloom, there is something so optimistic and simple about them, the slow anticipation is just perfect. I hope they are bringing a smile to my friends as we head into the New Year, a dash of living greenery and a bloom of colour to welcome in 2019. We decorated for Christmas at our usual time this year, around ten days before Christmas. This is early enough for me as I like to have the tree up until the Twelfth Night, or there abouts. And wonders will never cease - I even remembered to purchase the candy canes in time!!!! We have our usual haphazard arrangement of colourful mismatched decs on our old faithful artificial tree. Little B and I did the honours together, and I think we did a pretty good job. The tree isn't especially twinkly as we opted for battery powered lights after last year's kitty disaster (she chewed through a set of lights). But still, I do enjoy the gentle glow of it especially first thing in the morning when we come downstairs and it's still dark. I decorated both mantels as I usually do, pretty much the same as last year and I've really been enjoying the twinkly little lights and the various candles. I don't think you can ever have too much sparkle and glow at this time of year. Coffee Yeah!!!! Not much to add to that really is there??!! In fact, I'm not sure why I took this photo, other than to remember that there have been many happy little moments of daily sitting, sipping and taking stock during the past few weeks. It's not always easy to stop still and grant time to just be in the moment and allow thoughts to flow, but I think a mug of good coffee does aid that practice rather well. Yeah! On Christmas Eve we woke up to the most perfectly perfect winters day, brrrrrrrrrr it was freezing! Being that we were firmly in holiday mode and therefore not able to get out the door before midday, it was early afternoon by the time we set out for a walk. The above photo was taken from inside the car around 2pm, and with temperatures still well below zero the ice crystals on the windscreen were mesmerising to look at. ......following the frosty pathways through the trees. There were plenty of people out on this crisp, clear afternoon enjoying the fresh air, yet it still felt tranquil. Heading back towards the car in the late afternoon, and the prospect of snuggling up in the cosy cafe suddenly seemed very appealing. Did I mention how cold it was? Uh-huh, below freezing, and definitely frothy coffee/hot chocolate weather. On the way home we stopped a while on top of the moors to take in the sun - I think this was the exact moment when I finally felt ready for Christmas actually. So beautiful, those long distance, glowy golden views on the eve before Christmas. From one day to the next and the weather couldn't have been more different. If Christmas Eve was full of sparkly gold, then Christmas day was a dull pewter grey. We had an early start on Christmas morning thanks to Little B who woke us all up at 5.45am absolutely fizzing with excitement. Gosh, that boy, his mood was highly infectious and the pleasure we had from watching him delight in his presents was worth the lack of shut eye. J and I knew that we would meet huge resistance if we attempted to make the Little People venture outdoors on Christmas morning, so we took the decision to leave them behind. It was only for an hour - a quick walk into the woods as far as the pond, then back to the warmth of home. They barely registered that we'd been gone, all engrossed in new games and gifts. Although it was very gloomy out there, the fresh air was invigorating and I felt so glad of it. We spent a quiet day at home just the five of us, and I am so grateful for the gentle ease of it all. Since then, our days have merged into one long idle, contented blur. The kind where you wake up without an alarm, have no idea what day of the week it is, and wonder if you even need to bother getting dressed at all. It's been fabulous, and we are all rejoicing in the fact that we still have another week left to enjoy. I'm hoping to get out and about a bit more this week though, possibly to the seaside if I can get the family into the car to head west to the coast. Fingers crossed on that one. Right now it's almost 9pm on New Year's Eve and I am going to take myself back to the fireside with a glass of fizz. We are choosing a gentle close to 2018, it's been such a contented year for us as a family and I am truly grateful every single day for the happiness and fulfillment that I find in my life. Wishing you all a magical New Year, I hope you find happiness and joy in the little things and that life sparkles for you. Hello, how you doing? How's your week been? I wasn't going to post this weekend as I've had a rather traumatic few days (the lows in the above title) and am feeling rather worn down. But then I remembered how much better I always feel when I make time to sit quietly in the Attic and send my words out into cyber space for you to catch and read, and so here I am. Sitting, thinking, holding on to the memory of the highs in the above title. At the start of the week J and I took advantage of our non-working Monday arrangement (which has been one of the best things to happen for us in recent times) and set out to walk some miles in the Dales. It's a beautiful time of year for walking with perfect temperatures and amazing light, and the freshness of Autumn air is invigorating. It's a lovely time for J and I to chat too, and we end up talking about all sorts of random things as we cover the miles. ....strolling along peaceful riverbanks, climbing over stiles and striding across lush fields. I love it all. As you can see, it's looking gloriously Autumnal around these parts, and if you could zoom in on the above photo you would notice that the ground is absolutely covered with fallen conkers - loads and loads and loads of them! I have honestly never seen so many in all my life - great big juicy, shiny conkers for days. Linton Falls was spectacular in it's fullness, both the visuals and the noise levels, gosh this is one noisy bit of river! No matter how many times we visit this spot along the river Wharfe, it never fails to wow me, it's just so BiG and rushing and spectacular. As you well know, my heart is always happiest when it's be the sea shore, but this lovely stretch of river feels like home to me since we've been walking here for over twenty years. I snapped a photo of a pair of chattering magpies sat on the house at the top of my street on Tuesday. It's not often we see these birds around here, but I automatically thought - ahhhh, two for joy!! Yay!!!! (If you' don't know this rhyme, you can read about it here). The thought of something joyful happening really put a spring in my step, which is a bit ridiculous really, but some superstitions stick with you from childhood and they are hard to shake. I seriously hate seeing just one lonesome magpie. I've been finishing up the tutorial for my felted basket this week, taking lots of photographs and measurements before the basket goes on it's thrilling journey into the washing machine. I was meant to do that today, but chickened out haha!! I am both excited and nervous about putting all that work into a load of spinning hot soapy water, but I think tomorrow I should do it, don't you? I really want to show it to you and share the pattern - I've got a pure wool yarn pack all ready to go too, so I really do need to stop being a wuss. I wanted to share this with you as it's had a big impact on me this week. This is called "Five Ways to Wellbeing" and I came across it as I was researching online with Little B for his homework. I completely love that he's been talking about this in school - we talked a lot about it together too, about how we can look after our mental wellbeing and he made a fantastic presentation in his homework book all about it. I would consider myself to be very mentally healthy, but it's always good to be reminded not to take it for granted. The weather this week has been sublime, a beautiful slice of autumnal perfection. We've woken to very cold mornings with frost and low lying mist, but accompanied by the most delicious golden sunshine. The combination has been atmospheric and breathtaking, especially the way the mist swirls over the surface of the canal as we walk along the tow path to school. We played Eye Spy on this misty morning, Little B and I, crikey that child is ridiculously good at it. He picked something beginning with the letter T, and all the way to school I was trying so hard to get my brain to figure out what he might be seeing. All. The. Way. To. School. I had to give in when we ran out of walking time, much to his utter delight. Turns out is was T for Tag (as in the name tag on his guitar which I was carrying in my hand the whole way), I wanted to tell him off, but really I need to up my game. I've started eating Brunch on the days that I'm at home, and it suits me very well. I sit down with just a frothy coffee at 8am when the Little People are tucking into their bowls of cereal, then make myself something more substantial around 10.30. My current favourite thing is toasted multi-seeded bread, topped with mashed up avocado, a little olive oil, heavy-handed seasoning, and a poached egg. All those flavours and textures make my toes curl with pleasure. I then eat a light bit of mid afternoon snackage instead of a full blown lunch, and I so look forward to it! Sometimes it might be cheese and crackers with some fruit, or maybe some bread sticks with hummus and salad, or sometimes a toasted crumpet eaten with the Little People when they come home from school. We still all sit down for our main meal at around 5.30 and it's the highlight of my day, truly. I love love love family meals, they are precious times indeed. The past few days we've had a bit of an Indian Summer and I painted my toenails coral pink to celebrate. I even got to wear my sandals out today which pleased me enormously. As much as I love hand knit socks and colourful boots at the end of my feet in Autumn, nothing beats being able to wiggle your bare toes in the unexpected October sunshine. I took the above photos on Thursday evening as we walked down through the park on our way to the swimming pool, gosh the sun was something else at that time of day. It was low and golden, slanting through the trees as it made its end of day descent. We were running late so I wasn't able to linger as long as I would have liked - I am such a sun worshiper, I wanted to stand still and drink it in for long, long beautiful golden minutes. But I had to be content with some quick snaps, and then a bit of a run to catch up with J and Little B who refused to wait for me while I faffed. Little did we know at that time that within an hour, things would take such a dramatic turn. Gosh, life sure does throw a major wobbly sometimes! I won't go into detail, suffice to say that we spent six hours in the hospital that evening with J. He is OK and was able to come home, but it was flippin' scary at the time and we are still somewhat recovering from the trauma of it all. Despite very little sleep Thursday night, I felt the pressing need to be out of the house and surrounded by friends on Friday morning, with a much needed dose of caffeine and some gentle yarn therapy. I felt wrung out, but so so glad for the gentle rhythm of my hook and the happy conversations that flowed around me. I never cease to give thanks for the joy that crochet brings to my life, and how it soothes the soul when it is most needed. Before I go, I want to say a heart felt thank you for all your Birthday wishes on my last post, I'm so grateful for your kindness! I love the friendship that surrounds my little Attic window, thank you so very much for all that you send my way. ps without too much fanfare, could I possibly just show you this exciting news??? ?